For as long as I can remember all software demonstrations have started with search. It's one of the fundamental ways to convey ease of use to new users. 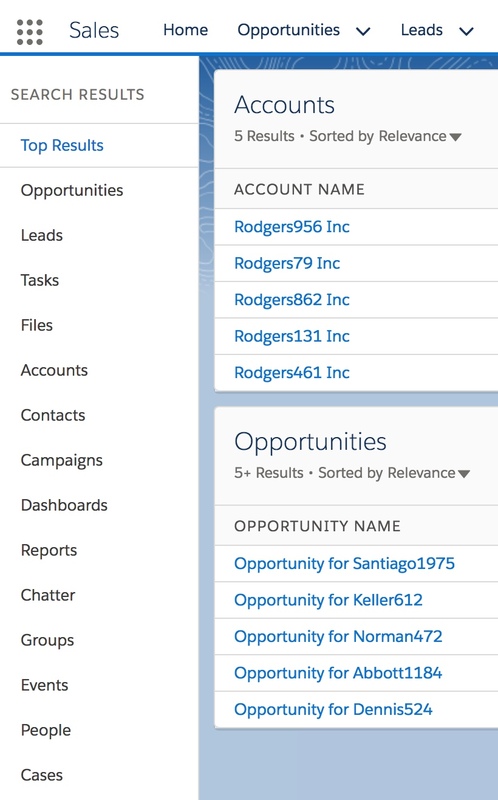 When I show someone Salesforce I also start with search to show them records are easy to find. They start to relax at that point, this stuff is easy. Search is Salesforce is particularly effective and from my personal point of view and through observations with customers it's a well used and very functional. In each update release there are search improvements. In this post I'm going to outline the Winter 18 search features. Text from a created record may not be immediately available for search. It could take a few minutes so if you're that impatient go and make a nice cup of tea. You can't search every object and hidden tabs will have that object's results excluded from search. Search mirrors your permissions. If you don't have permission search won't show it. I don't think I'm unique in constantly trying to type too fast and spending half of my life correcting the garbage on the screen in front of me. We get used to Google's helpful suggestions when a search term is incorrectly spelt and I'm going to guess that many of us use Google search to spell uncertain words before they go into a text message. I do anyway. You previously had to be careful about spelling when searching in Salesforce. If the search term was incorrectly spelt Salesforce wouldn't find it due to to mismatch in the database. Now when I forget to spell my own name, Salesforce will find the closest approximation as follows within the Enhanced Instant Results. When searching the list of top objects under Top Results has been expanded which is based on the Lightning menu navigation bar. As search usage progresses the search will increasingly focus on frequently accessed objects. Search also operates an expanded list of objects. A nice feature if the ability to sort a search list based on different criteria, depending on the fields in the object setup. Sorry I can't show a screen clip here as launching Grab removes the drop-down filters described above. It works, honest guv. For those admins still having difficulties in the transition from classic to lightning configuration, the Quick Find search box is much quicker and delivers more results. And this admin has noticed while writing this blog that you have to click once in the search box. To explain, prior to this update, when you selected search in Lightning you'd click in the Quick Find box and your cursor wasn't there, probably due to a screen refresh. Then you'd have to click again. Yes, minor but annoying. 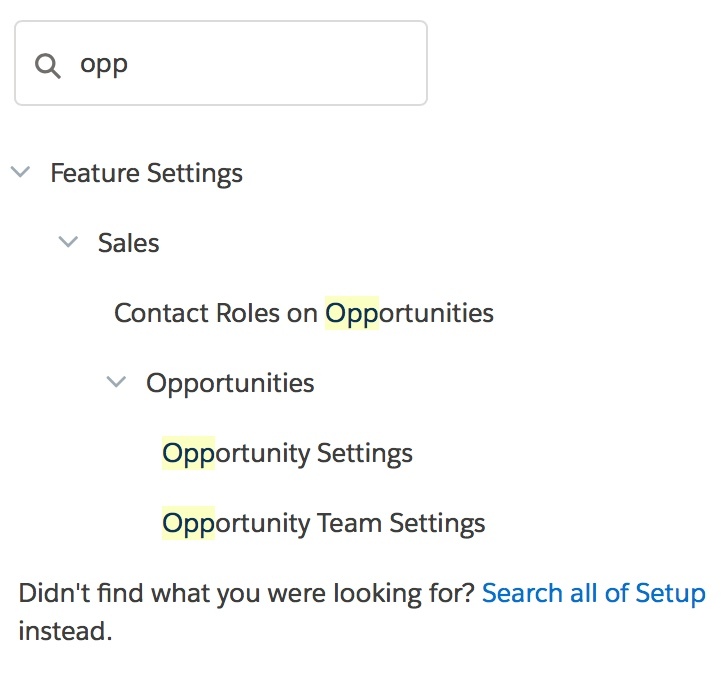 If Quick Find doesn't give you the answer you need there's a new “Search all of Setup” option that searches users, profiles, permission sets, objects, fields and groups and queues. Older PostWhat does Sales Cloud Einstein mean for you?